Forklifts are used in warehouses all around the world to load/unload trucks and organize palletized merchandize on shelves. If you run a distribution or warehouse management business, you definitely must have a number of forklifts for everyday operations. How Much Money Do You Want to Spend on a Forklift? The answer is, of course, as little as possible. However, when you think of the importance of this investment, the long useful life of a forklift and the benefits of being the first owner, you would be tempted to dig deep in your available capital to buy new forklifts. But is it really a wise investment for your business? If you were the CEO of a large corporation, you would probably not be reading this article. Since you are reading it, chances are you have a small or medium sized business and you rely on a limited budget. In order to justify the premium price, manufacturers equip new forklifts with lots of gadgets and functions. Some of the dashboards of latest forklift models are full of touch pads, pushbuttons and joysticks. It would take your employees quite a lot of time to become familiarized with all these functions and operate the forklift correctly. By comparison, a used forklift is simpler and more straightforward in operation. Most of your employees probably got their initial job training on one of these models. Thus, there will be no downtime in your operations while your team learns how to use the equipment. Have you seen the user manual for a new forklift? It looks the size of a book and it is full of complex instructions for preventive care and maintenance. As machines incorporate more and more new technologies, they become more sensitive and need special care. A used forklift already comes with a set of instructions from past maintenance checks. The handbook of the equipment has the full track record of maintenance works, preventive care activities and repairs performed on it. All you have to do is continue doing what the previous owner did and your forklift will be in good working conditions for years to come. New forklift models take a lot of time to ship. Manufacturers usually send them in batches, so you will probably have to wait a few weeks until you receive your order. But a few weeks’ break in your business activities is not feasible – you would lose sales and client accounts. 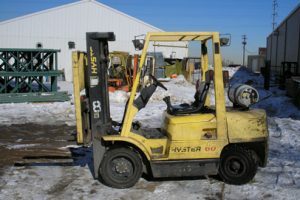 Used forklifts, by comparison, are readily available to ship as soon as you have concluded the contract with the dealer. In a few days, your workers are ready to load and unload merchandize and you will be able to fulfill all the contractual obligations on time. If you are shopping for new forklifts, you have fewer models to choose from. Some of them are outside your budget range (and too advanced for your needs, as well). Thus, you do not really have a lot of choice. Used forklifts for sale come from various years of manufacturing and series of the same model. Thus, you can find a forklift that offers you the best cost/benefit ratio based on its age, brand and range of functions. Copyright © 2019 michaelwestwood.net. Powered by WordPress. Theme: Accelerate by ThemeGrill.